Digitalization is reshaping business both in Finland and around the world – and the organizations that embrace digitalization are outperforming their peers in every industry. It is becoming ever clearer that Finnish organizations must pursue digital transformation in order to compete on a global scale. This report seeks to assess the digital state of Finland based on interviews with executives from 22 leading Finnish organizations, both commercial and public. 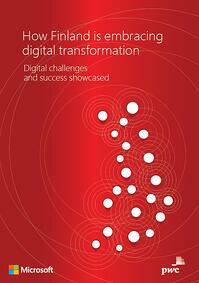 The report examines digital transformation from three key perspectives: what, why and how. For an even more in-depth look into digital transformation, the report contains comprehensive case studies that detail the digital journeys of the following organizations: Wärtsilä, Verohallinto, OP, Veikkaus, S Group, Fortum, Finnair and LähiTapiola. Please fill in the form to receive the report in your email (free of charge)! Please fill in the form to receive the Digital transformation survey report in your email.